Karl Horeis: "The ground out here is often covered with many tiny plants. Some look like tiny ferns while others look like branches from little cedar trees. 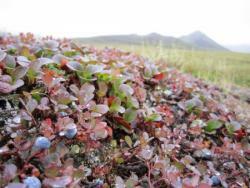 Note the ripe blueberries in the foreground, a favorite among bears (and archaeologists)." Raven Bluff, Alaska. Photo by Karl Horeis. The goal of this expedition is to understand arctic terrestrial change by monitoring vegetation communities in northern Alaska associated with the International Tundra Experiment Arctic Observatory Network (ITEX-AON). The team will study environmental variability and increased temperature on tundra plant phenology, growth, species composition and ecosystem function. The ITEX network works collaboratively to study changes in tundra plant and ecosystem responses to experimental warming. The network monitoring sites are located across many major ecosystems of the Arctic. This project will provide urgently needed data critical to understanding the impact of multi-scale vegetation change on ecosystem function, namely land-atmosphere carbon and water fluxes and energy balance. Toolik Field Station, from the team's helicopter. Toolik Field Station, Alaska. Photo by Josh Dugat. From Fairbanks, Alaska the team will embark on an eight hour drive to Toolik Field Station, located in the northern foothills of the Brooks Range in northern Alaska. Toolik Field Station is operated by the Institute of Arctic Biology at the University of Alaska Fairbanks and has hosted hundreds of researchers and students every year since 1975. The team's research sites around the Toolik Lake area on foot. Some work will be conducted at Alyeska workpad along the Alaska pipeline. 21 March 2019 So Many New Adventures! PolarConnect event with teacher Melissa Lau and researchers Jeremy May and Matthew Simon discussing their research on Phenology and Vegetation Change in the Warming Arctic. This presentation was broadcast live from Toolik Field Station, Alaska on 20 June 2018. This story about PolarTREC teacher Melissa Lau and her upcoming trip to the Arctic, ran on the local Oklahoma ABC affiliate May 22, 2018. Local news coverage (Channel 9, Oklahoma City, OK) of Melissa Lau's upcoming expedition in Alaska. - Jump to Journal - 26 March 2018 North To Alaska 27 March 2018 Welcome To Oz... 13 May 2018 Tundra In the Tropics 3 June 2018 No Worries 5 June 2018 Look Ma, I'm On Top Of... 6 June 2018 Day 1 on the Tundra! 7 June 2018 Home Sweet Home 8 June 2018 Tundra Commute 9 June 2018 Rooftop Of The World 10 June 2018 So What, Exactly, Are You... 12 June 2018 Toolik Bound 13 June 2018 Bears, Berries, and OTCs 14 June 2018 Toolik Snow Day Tour 15 June 2018 Sagwon 16 June 2018 My First Tram Run! 17 June 2018 The Drone Invasion 18 June 2018 Here Comes The Sun 19 June 2018 Tracking Phenology 20 June 2018 Quantitative And... 21 June 2018 Happy Solstice!! 22 June 2018 Land Of The Midnight Sun 23 June 2018 Nutrition Mapping The... 24 June 2018 Antigun Falls 25 June 2018 Routine...Finally 26 June 2018 Just Let Me Have My Moment 27 June 2018 Just Made It Before The... 28 June 2018 Crafting A Message 29 June 2018 Team Vole Part 1 30 June 2018 What Do You Mean It's... 1 July 2018 Slope Hike 2 July 2018 Thermokarst 3 July 2018 The Farewell Tour 13 July 2018 Been There, Done That, Got... 21 March 2019 So Many New Adventures! Melissa Lau teaches 6th grade science at Piedmont Intermediate in Piedmont, Oklahoma. In her 18 years of teaching she has taught ages Pre-K through 6th grade first as a music teacher and later, a classroom teacher. In the summers, Mrs. Lau works with the non-profit organization, Great Expectations, sharing researched based best practices with 100’s of teachers. Melissa grew up in the small western Oklahoma town of Weatherford. It was here where she spent her childhood exploring the outdoors and sparking her love and curiosity for nature. She feels through her teaching she can instill some of that spark in her students. Steven Oberbauer is a Professor of Biological Sciences at Florida International University in Miami. Dr. Oberbauer received his B.S. and M.S. degrees from San Diego State University, where he was first introduced to arctic research. He completed his Ph.D. at Duke University studying the ecophysiology of tropical trees in Costa Rica. Dr. Oberbauer currently researches climate change effects in both the Arctic and the Tropics, specifically how plants adjust to changes in their environment and resource availability. Jeremy May is a visiting postdoctoral research associate in the Department of Biological Sciences at Florida International University in Miami, Florida, USA. He has worked in Arctic Alaska for over 10 years studying the effects of climate change on tundra vegetation. The current project that he works on with Dr. Steve Oberbauer focuses on incorporating traditional, plot-scale vegetation monitoring techniques with landscape-scale, remote sensing technology. In addition to his work in the Arctic, he also studies the impact of hurricanes within the Everglades ecosystem of South Florida.